It's been a stressful year with working on my degree, Holly breaking her elbow, and losing Cali. We thought that Sydney was having a hard time dealing with not having a friend. And, I think after Sydney, we're clearly a two dog family. 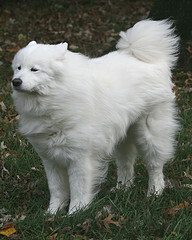 We've loved the Samoyed breed and really miss some common Samoyed characteristics that we've had in the house for 12 years. 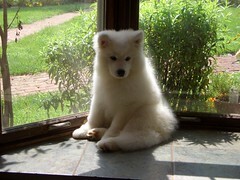 I know we're not ever going to replace Cali, but we thought that getting another Samoyed would make us happy and give Sydney a familiar-ish playmate. So, we started talking to breeders. In the August 2009 issue of The Equiery magazine, Holly placed a memorial ad with some of the most beautiful words I've read: "You were our companion, playmate, deputy and shower guardian. May you forever play the tree game in the wind. Woo-woo-woo." I can't read that without crying. Cali as a special girl and we'll always miss her. I love you, Holly. I miss you greeting me at the door when I get home, girl.